Buy Now and Save Discount = 15%! Marching Mellophone Description: Mellophone Specs: 0.468 Bore Size, 10.5 Inch Front Marching Bell, 3 Stainless Steel Pistons, Brass Body, Laquered Finish. Accessories: Marching Mellophone Case, Mellophone Mouthpiece, Low Brass Care and Maintenance Kit. Marching Mellophones are used in marching bands throughout the US. Mellophones offer a front facing bell and are in the Key of F. Mellophones produce an exceptionally loud tone and are usually used outdoors. Select from Buy Now, EZ Pay 3 or Rent-To-Own options for a a New Marching Mellophone. 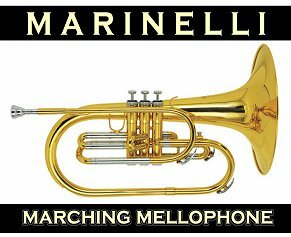 We can ship your Marching Mellophone Rental anywhere in the USA! Order Online Now.